An ankle strap and a chunky heel? That's all it takes to get us. 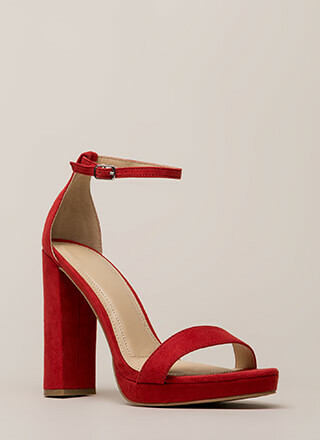 Chunky, open-toe, vegan suede heels feature an open sandal design that includes a single toe strap, a low platform, and an extra skinny ankle strap with an adjustable buckle. Shoes are finished with exposed sides and a ridged sole.